House of Bourbon: Tattoo Me Up! Today, Dominic came to me and asked if I could draw the Dark Mark on his arm. I said, "Of course," despite the fact that I am not great at drawing. It turned out pretty decent, especially considering the fact that I drew it without practicing first. I guess I'm saying I'm happy with it, which is good, since I drew it with permanent marker. We don't believe in that washable stuff at our house. This is Dominic's "I'm a mean Death Eater" look. It's intimidating, isn't it? The problem with tattoos is that they're addicting. You can never have just one. We bought our first house when Gabriel was not quite two. All that time spent in the mortgage office was taken up teaching him how to read his name, his letters, his numbers, and his shapes. I had a Sharpie with me wherever we went, and I drew whatever I was teaching him on his arm. This was a great way to make sure he would always have it with him. It started out as a way to keep him busy, and ended up being a great learning tool, so don't judge me. 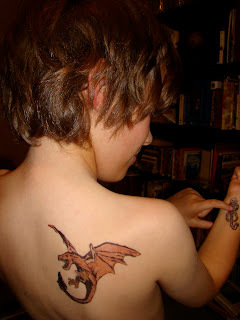 Anyway, when Dominic came to me and told me he was bored, I asked him if he wanted another tattoo. His immediate answer was an unequivocal yes. He just had to figure out what he wanted. That kept him busy for a while, 30 minutes to be exact. Back he came with a request for a Hungarian Horntail. Now, if you're a Harry Potter fan, you know that the Hungarian Horntails are the meanest dragons out there. Dominic's a bit of a Harry Potter fanatic. Now, if only we can figure out a way to keep that dragon on there a while.